With the 70?s behind him, San Diego’s top rated newsman, Ron Burgundy, returns to the news desk in Anchorman 2: The Legend Continues. Also back for more are Ron’s co-anchor and wife, Veronica Corningstone , weather man Brick Tamland, man on the street Brian Fantana and sports guy Champ Kind – All of whom won’t make it easy to stay classy…while taking the country’s first 24-hour news channel by storm. "When did the news get awesome?!" With the advent of the 24 hour news cycle, televised reporting has gradually devolved into an increasingly sensationalized carnival of superficial factoids, empty patriotism, forgettable fluff pieces, nauseating redundancy, and questionable corporate synergy. Indeed, the very manner in which our culture consumes information is now tainted and sullied by -- wait a sec, what movie am I reviewing again? Oh, right, 'Anchorman 2.' Please disregard all that nonsense I just wrote. After all, this is a film about a guy who bottle-feeds a shark… and I wouldn't have it any other way! If the news is going to be perverted and trivialized, it might as well be done by a man with a killer mustache and salon quality hair! Following the events of the first film, Ron Burgundy (Will Ferrell) and his wife Veronica Corningstone (Christina Applegate) are now co-anchors for a successful station in New York. But when Veronica receives a promotion and Ron is fired, the once proud reporter becomes enraged and hits the road. Down-on-his-luck and with no one to turn to, Ron is eventually approached by a new network called GNN that wants Burgundy to help launch their 24 hour news station. Reinvigorated, he puts the old team back together (Steve Carell, Paul Rudd, and David Koechner) and sets out to stomp new and old rivals while he attempts to recapture the hearts and minds of America. Released nearly ten years after the original in the wake of repeated false starts and studio apprehensions, this sequel has been a long time coming, and fans have had some pretty big expectations. 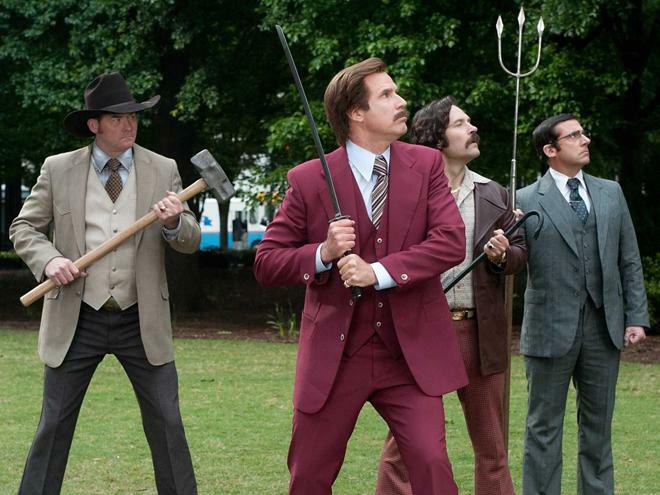 'The Legend of Ron Burgundy' has only grown in popularity, and for the most part, faithful viewers (myself included) basically get exactly what they've been clamoring for: more silly shenanigans tied together through increasingly loose plotting and amusing performances. With that said, the flick can't quite reach the same unashamedly goofy heights as the first film, and the hodge-podge assemblage of improvised jokes and cartoon antics no longer feel as fresh or lively as they once did. Likewise, the narrative's inherent randomness sometimes feels a little too cobbled together and listless, and some jokes outstay their welcome (Ron's third act setback is overplayed). To their credit, however, the ensemble continues to go all in on every bizarre tangent and throwaway line, shooting for the stars with each gag. Sure, there are some notable misses here and there, including an occasional overreliance on callbacks and recycled references, but thankfully even the failed jokes still manage to elicit a smirk, and the bits that do work really are very funny. The core cast is once again the film's highlight, with solid turns from Ferrell, Carell, Rudd, and Koechner. They all seem genuinely happy to be back behind the news desk and the chemistry between the gang is still great, leading to some memorable scenes that feature the four riffing off of one another. Christina Applegate also makes the most out of her somewhat limited screentime, and newcomers like Meagan Good, Kristin Wiig, James Marsden, and Greg Kinnear all fit well into the flick's unique comic sensibilities. Of course, there's a ton of amusing cameos as well, and while I won't give away any of the surprises, the sequel's epic follow-up to the first film's "news team fight scene" really is a sight to behold. Eschewing the franchise's already tenuous relationship with reality even further, the brawl sequence is an utterly nonsensical mishmash of fantastical action and hilarity -- and it's all kind of awesome. While my introductory musings on the pitfalls of 24 hour news were mostly meant in jest, the movie actually does end up offering some surprisingly solid commentary on superficial reporting. In an effort to raise their ratings and fill their endless airtime, Burgundy and company resort to sensational stories and empty fluff pieces, slyly poking fun at the type of empty, nauseating reporting that has now become the norm. It's never exactly biting satire, mind you, but that's not really what the filmmakers are going for. The emphasis is still on immature gags, improvised jokes, witty quips, and absurd diversions (as it should be), but it's nice to have just a little bit of substance to go along with other decidedly more crazy scenes that feature people eating fried bats, nursing sharks, and battling minotaurs. With 'Anchorman 2,' the legend of Ron Burgundy does indeed continue, weaving another comical tale of absurdist journalism that pokes fun at 24 hour news coverage with a cornucopia of never-ending random silliness. Sure, the jokes and gags are definitely uneven, but the cast is still fun to watch and the movie's increasingly goofy tone is hilariously endearing. It's not as consistently funny as its predecessor and the characters don't feel quite as fresh, but Ron, the gang, and his mustache all make a welcome, unabashedly ridiculous return. Despite a few overly dumb diversions, director Adam Mckay and star Will Ferrell always manage to follow one very important rule: They stay classy. Very classy. 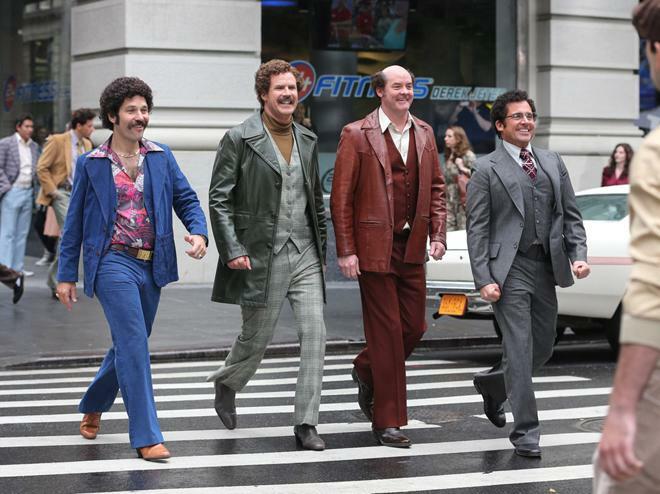 Paramount presents 'Anchorman 2: The Legend Continues' in a Blu-ray/DVD/Digital HD combo pack. Two BD-50 discs come housed in a keepcase with a cardboard slipcover along with a single DVD and instructions for a digital copy. Three cuts of the film are included in the release. The first Blu-ray disc contains the original 118 minute theatrical version and a slightly longer 122 minute unrated cut that features a few alternate lines with more profanity. The second Blu-ray disc features the Super-Sized 143 minute R-rated version that was previously released in theaters for one week on February 28. This cut offers alternate takes, excised scenes, and 763 new jokes, including an elaborate musical number that was deleted from the original edit. Finally, the DVD contains the original theatrical version in standard definition. After some skippable trailers, the discs transition to standard menus. The movie is provided with a 1080p/AVC MPEG-4 transfer in the 2.35:1 aspect ratio. Sharp, bright, and vivid, the image looks pretty spectacular, bringing the colorful world of Ron Burgundy to life in style. The digital source is essentially pristine with no major artifacts to speak of. Clarity is great, offering a strong sense of fine detail, depth, and texture, rendering every whisker on Burgundy's legendary mustache and every furrow in his frequently quizzical brow. Colors are bright and cheery with a nicely saturated palette that pops with bold primaries throughout all of the retro production designs and costumes. Contrast is high without blooming, and blacks are deep and consistent. Free form any notable issues, and packed with great detail, dimension, and pop, 'Anchorman 2' comes to Blu-ray with a very classy transfer. The film is presented with an English DTS-HD MA 5.1 track along with optional English SDH, English, French, and Spanish subtitles. Fueled by great songs and lively effects, this is a very solid mix that enhances the movie's silly tone well. Dialogue is mostly clean and clear throughout, making it easy to hear every word of the film's constant barrage of jokes and absurd references. With that said, I did detect some very minor crackle in high frequencies. The soundstage is nice and spacious, with a pleasing sense of atmosphere in the movie's city locations and office settings. Directionality is also good and effects and speech move throughout the speakers when called for. The film's climactic news battle scene is a real highlight as well, and the insane fight sequence is full of explosions and aggressive design work with decent bass activity. Dynamic range is wide throughout, especially in the music tracks which offer warm texture and impeccable fidelity. For a joke oriented comedy, the movie offers a strong audio mix, giving due emphasis to the dialogue while still providing a decent sense of immersion and energy. It appears that all of the included supplements are exclusive to the Blu-ray release. 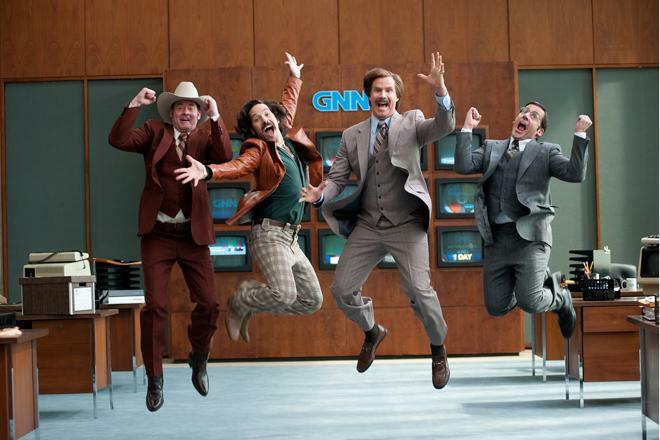 'Anchorman 2: The Legend Continues' finally gives fans more of Ron Burgundy and the Channel 4 News Team, offering another crazy adventure full of random silliness and goofy cartoon antics. While the constant barrage of jokes doesn't always land, the movie as a whole is pretty damn funny and it's great to see the cast back together. The Blu-ray features a great video and audio presentation, and with three different cuts, several behind-the-scenes featurettes, and over 90 minutes worth of alternate material, this set is absolutely packed with entertaining supplements. The flick isn't as consistent and original as the first film, but it's still a worthwhile sequel and this is a fantastic release from Paramount. Recommended.